over for dinner. In the afternoon Jennie Woolf Hattie and Edith were here. I did not accomplish much of any thing. Uncle Jacob was here in the morning. We walked up town in the evening. 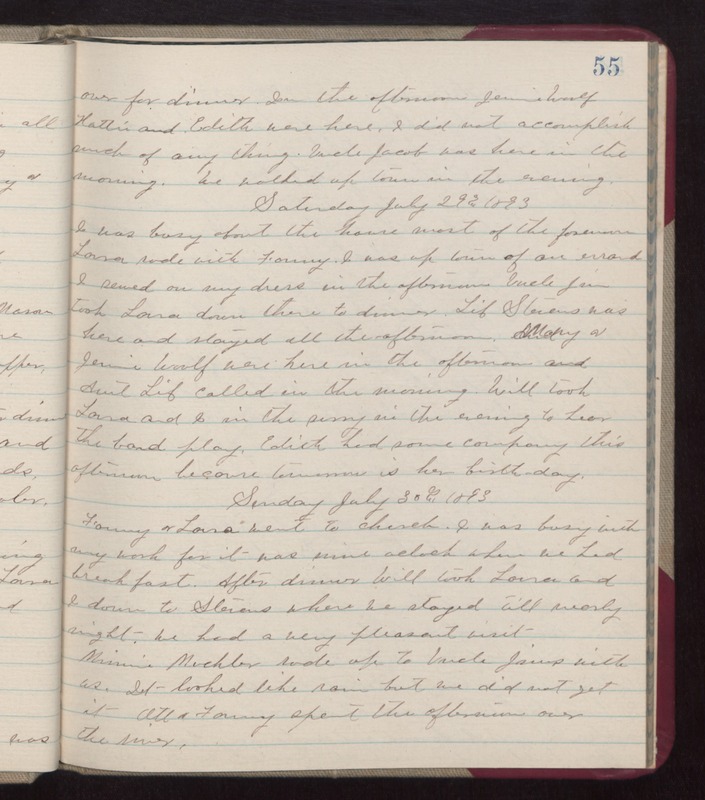 Saturday July 29th 1893 I was busy about the house most of the forenoon. Laura rode with Fanny. I was up town of an errand. I sewed on my dress in the afternoon. Uncle Jim took Laura down there to dinner. Lib Stevens was here and stayed all the afternoon. Mary & Jennie Woolf were here in the afternoon and Aunt Lib called in the morning. Will took Laura and I in the Surry in the evening to hear the band play. Edith had some company this afternoon because tomorrow is her birthday. Sunday July 30th 1893 Fanny & Laura went to church. I was busy with my work for it was nine oclock when we had breakfast. After dinner Will took Laura and I down to Stevens where we stayed till nearly night. we had a very pleasant visit. Minnie Muchler rode up to Uncle Jims with us. It looked like rain but we did not get it. Ott & Fanny spent the afternoon over the river.